New Delhi: With a Rs.1,60,950 crore ($24 billion) fortune, Reliance Industries Ltd chairman Mukesh Ambani continues to be the richest Indian for the fourth consecutive year, according to the Hurun report. 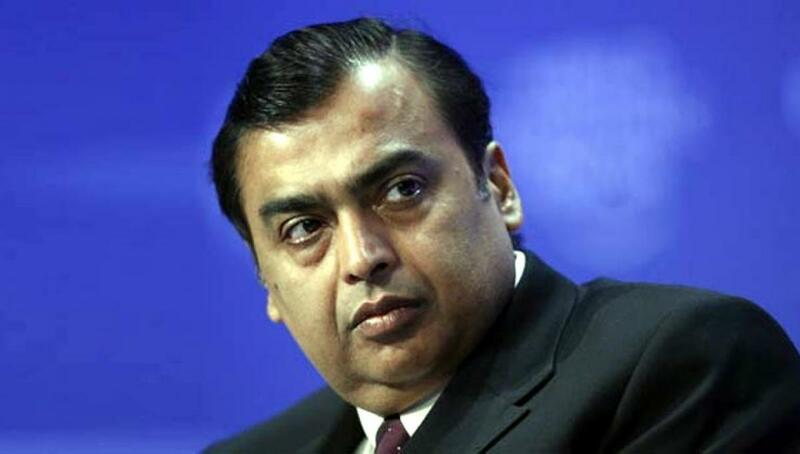 "Mukesh Ambani (58) of Reliance holds on to his position as the richest man in India, with a personal fortune of Rs.160,951 crore, three percent less than last year," Hurun Report India head Anas Rahman Juniad said here. For the first time, Wipro czar Azim Premji (69) slips out of top five billionaires' spot owing to his philanthropic donations, while Bengaluru-based biotech leader Kiran Mazumdar-Shaw (62) is the only self-made woman in the top rich list, though her net worth declined six percent to Rs.6,143 crore. Shanghai-based Hurun report started off by listing the richest in China but has expanded to include India and global lists. The China list was started in 1999 by Rupert Hoogewerf, a chartered accountant, who earlier worked with Arthur Andersen. "India had a mixed year with sectors like mobile phone and e-commerce doing well, while others such as real estate and energy had a bad year. Overall, it was an average year for entrepreneurs," the report found. According to the report, London-based SP Hinduja (81) and family of the Hinduja Group jumped to third rank from sixth in a year after their wealth shot up 43 percent to Rs.103,030 crore, HCL founder-chairman Shiv Nadar ranked, the report noted. With 33 percent increase in wealth creation to Rs.47,608 crore, Kotak Mahindra Bank vice-chairman and managing director Uday Kotak (55) entered into the top 10 billionaires ranking. As against 220 individuals last year, number of people with more than Rs.1,600-crore in personal wealth has increased 76 this year to 296. The combined wealth of India's richest is a staggering $478 billion, equating to 22 percent of the country's GDP (gross domestic product) last year and larger than the GDPs of UAE ($402 billion), South Africa ($350 billion)A and Singapore ($308 billion). Six percent devaluation of rupee against dollar and a lacklustre performance of key sectors such as steel, energy and real estate reduced average wealth of the rich seven percent on annualized basis. Data analytics major Mu Sigma founder Dhiraj Rajaram (40) is the fastest riser with wealth shooting up a whopping 593 percent to Rs.17,790 crore. In contrast, wealth of 58 billionaires declined, with some of them in the oil and gas sector, in which prices have declined by over 50 percent in a year. For instance, wealth of Ajay Kalsi (54) of Indus Gas slumped 242 percent to hit the bottom of the rich list. Mumbai continues to be richest city in the country with 29 percent of billionaires residing, followed by Delhi with 19 percent and Bengaluru with eight percent. Manufacturing dominates the wealthy list with 15 percent, followed by pharma at nine percent and real estate six percent. Ola Cabs co-founders Ankit Bhati, 28, and Bhavish Aggarwal, 29, are the younger self-made Indians in the list, followed by tyre prince Rajiv Poddar (30) of Balakrishna Industries. Wealth calculations are a snapshot of net worth of living individuals as of July 31, when the rate of exchange to the dollar was Rs.64. Commenting on the report, Joyalukkas chairman Joy Alukkas India was adding more billionaires, whose number had gone up to 124 from 109 last year and 59 in 2012. "Of them 36 migrated from the country and have become non-resident Indians (NRIs), with wealth of three doubling every year," Alukkas said, citing the report.